Ok, ok, ok … fine. I will admit it: I have (a very mild version of) OCD. Obsessive Compulsive Disorder. No, I’ve never been formally diagnosed, but if you met me, you’d concur … Or maybe I’m just a neat freak who loves being organized. No, I don’t need all the freaking canned goods labels facing forward, but yes, I require ORDER in my world. And, yes, I come a little unglued when things are messy, cluttered, or out of order. And I also loathe germs. Dirty, germy, cluttered messes make me crazy, make my skin crawl. I can’t think. I start to sweat, I start to hyper-venhilate. I cannot tolerate clutter. I can’t think with a cluttered desk – never could, not as a child nor an adolescent. That’s probably why when I got a laptop in my early 30’s I felt like I discovered the secret to the Universe! I have loved it ever since … Never want to go back to a desktop. I wondered how that would go down when I had a child. Would I be able to handle the chaos of childhood exploration? Especially being a mom to a boy? Boys are messy, boys are dirt wrapped in smiles and hugs and kisses and I-Love-You’s. I’m thankful for the Aspergers, in a way, because The Boy does have a dash of OCD, He needs his hands nice and neat, clean and non-sticky. The Boy won’t tolerate dirt or debris in his world. He adores order. I respect that so much. I admire his early love of organization … and part of me worries that I’m encouraging Asperger behavior because I do not mind (at all) his orderly, neat, clean, tidy, perfect little ways. For now, I’m not going to think about this too much, not going to worry that I’m somehow corrupting him, though I will tell you, I DO encourage him to get his fingers dirty with glue, his hands messy with play-do and dirt and cookie dough. Slowly but surely, I’m building his tolerance for these types of sticky, yucky things. But, yes, I do have a canister of hand wipes at the ready! Well, tonight I waited until he went to sleep to embark upon PROJECT PLAYROOM. I have a love affair with my P-Touch … It’s a cheap high, heehee. And, truth be told, organizing stuff relaxes me. Well, that and wine. I have always loved organizing and cleaning. When I was a little girl, I would (and i’m 100% not joking) I would mess up my perfectly clean room just to reorganize and clean it — all of my books were alphabetically arranged in order: A-Z, perfectly. I was 8 when I began this organizational obsession of mine. They did not have P-Touches back then, but they had those Dymo Label makers & I was ob-freaking-sessed with that thing by the time I was 4. I labeled everything, even my mom’s vacuum! However chill as I got, I still am an OCD girl at heart. I love & appreciate organization and order. I will never look upon that as a negative thing. It helps to organize the mind, calm the mind, categorize thoughts in the mind. At least it does mine … And sometimes it relieves my brain from thinking about other things too much. It helps me focus on something tangible: I can’t fix the US Economy, but I CAN reorganize my junk drawer. 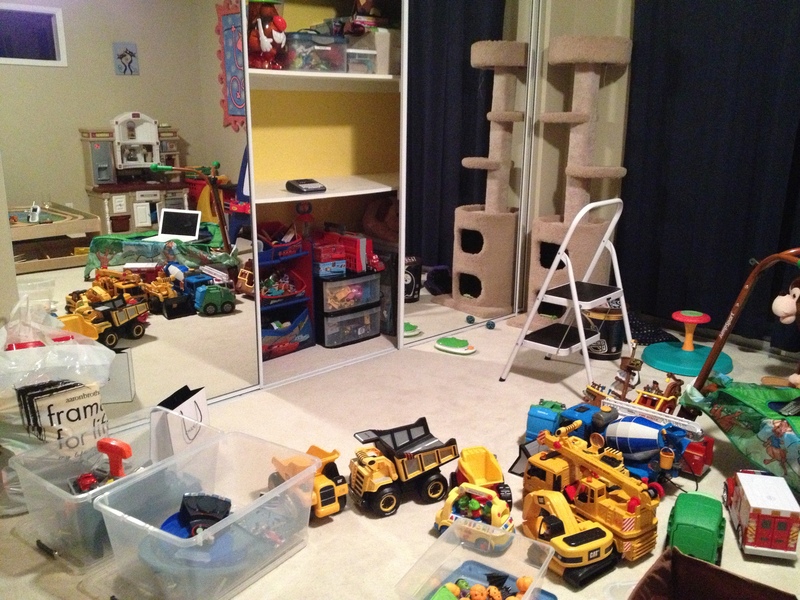 So, tonight, I turned my focus on The Boy’s Playroom. After – part of closet … Yes, I know Mr. Potato Head is eyeless. They were at the bottom of the barrel & I was too lazy to get them. Everything in its right place. 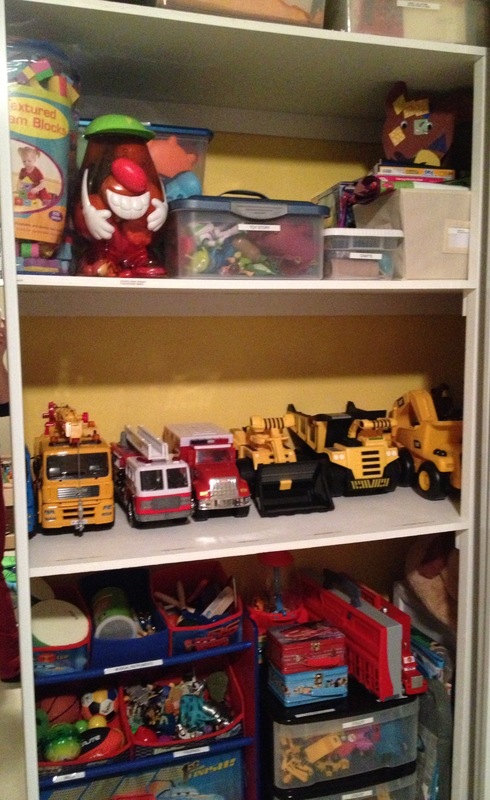 I told The Husband before he retired to bed that I would label everything (at his – sort of joking – request,) so that he could refrain from just “throwing” toys haphazardly into the closet, thereby giving me a mini-stroke when I flung the closet open to see the chaos. He is learning. I am being patient. My P-touch is helping. My P-touch is a savior. My P-touch might be my lover … joking.